Satisfy your inner culture vulture at Ginza and Asakusa. Give yourself a bit of retail therapy at Tsukiji Market and Omotesando. There's much more to do: explore the galleries of Tokyo National Museum, take a stroll through Odaiba, admire the striking features of Tokyo Tower, and see the interesting displays at Edo-Tokyo Museum. To find maps, other places to visit, more things to do, and more tourist information, read our Tokyo tour planner. Vancouver, Canada to Tokyo is an approximately 13.5-hour combination of car and flight. You'll lose 17 hours traveling from Vancouver to Tokyo due to the time zone difference. Traveling from Vancouver in September, things will get a bit warmer in Tokyo: highs are around 31°C and lows about 27°C. Finish your sightseeing early on the 27th (Wed) so you can travel to Miyakojima. 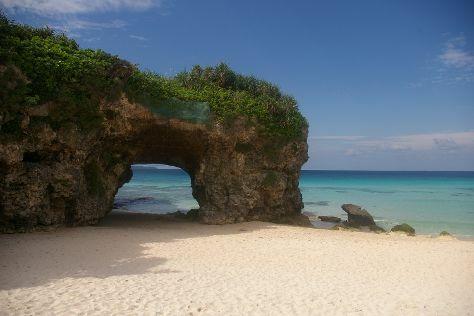 You'll get in some beach time at Aragusuku Beach and Sunayama Beach. You'll discover tucked-away gems like Toguchinohama and Maja Beach. There's much more to do: take in the views from Irabu Bridge, kick back and relax at Yonaha Maehama Beach, don't miss a visit to Ikema Ohashi Bridge, and enjoy the sea views from Higashi Hennazaki Lighthouse. For traveler tips, other places to visit, ratings, and other tourist information, use the Miyakojima vacation trip planner. Do a combination of bus, flight, and taxi from Tokyo to Miyakojima in 4.5 hours. When traveling from Tokyo in September, plan for somewhat warmer days and about the same nights in Miyakojima: temperatures range from 35°C by day to 30°C at night. Finish up your sightseeing early on the 2nd (Mon) so you can travel to Ishigaki. Relax by the water at Yonehara Beach and Fusaki Beach. Discover out-of-the-way places like Tamatorizaki Observatory and Cape Hirakubozaki. Explore Ishigaki's surroundings by going to Taketomicho Iriomote-jima (Pinaisara Falls & Hoshisuna Beach) and Nakamoto Beach (in Kuro-shima Taketomi-cho). And it doesn't end there: see some colorful creatures with a scuba or snorkeling tour, add some adventure to your tour with a kayaking and canoeing tour, take in the pleasant sights at Cape Ongazaki, and contemplate the long history of Ishigaki Yaima Village. For more things to do, maps, where to stay, and more tourist information, read Ishigaki holiday planner. Do a combination of taxi and flight from Miyakojima to Ishigaki in an hour. In October, daytime highs in Ishigaki are 33°C, while nighttime lows are 27°C. Finish up your sightseeing early on the 6th (Fri) so you can travel to Naha. Visit Aharen Beach and Furuzamami Beach for some beach relaxation. Eschew the tourist crowds and head to Nakayukui Market Onna Station and Okinawa Peace Memorial Park. 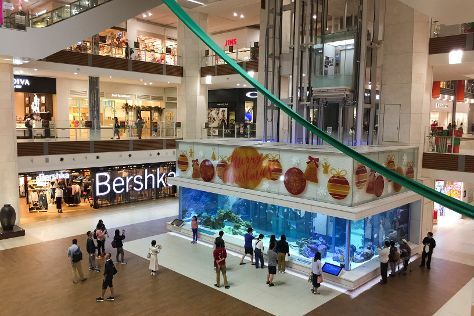 Venture out of the city with trips to AEONMALL OKINAWA RYCOM (in Kitanakagusuku-son), The Tower of Himeyuri (in Itoman), Sefa-Utaki (in Nanjo) and Tokashiku Beach (in Tokashiki-son). There's lots more to do: stroll through Shurijo Castle, buy something for everyone on your list at OKINAWA OUTLET MALL ASHIBINAA, explore the world behind art at Okinawa Prefectural Museum & Art Museum, and steep yourself in history at Former Japanese Navy Underground Headquarters. To find ratings, other places to visit, photos, and other tourist information, you can read our Naha trip itinerary builder. Getting from Ishigaki to Naha by combination of taxi and flight takes about 1.5 hours. October in Naha sees daily highs of 32°C and lows of 27°C at night. Wrap up your sightseeing by early afternoon on the 11th (Wed) to allow enough time to travel to Hiroshima. Hiroshima Peace Memorial Museum and Yamato Museum will appeal to museum buffs. Hiroshima National Peace Memorial Hall for the Atomic Bomb Victims and JMSDF Kure Museum are good opportunities to explore the local culture. Get out of town with these interesting Hiroshima side-trips: Hatsukaichi (Mount Misen & Miyajima). The adventure continues: don't miss a visit to Hiroshima Peace Memorial Park, appreciate the history behind Atomic Bomb Dome, and explore and take pictures at Mazda Zoom-Zoom Stadium Hiroshima. For maps, ratings, reviews, and more tourist information, use the Hiroshima travel itinerary planner. Traveling by combination of train, subway, flight, and taxi from Naha to Hiroshima takes 4 hours. Alternatively, you can do a combination of train and ferry. Prepare for slightly colder weather when traveling from Naha in October: high temperatures in Hiroshima hover around 26°C and lows are around 17°C. Finish your sightseeing early on the 14th (Sat) so you can take a train to Kyoto. Shop till you drop at Dotonbori and Kyoto Station Building. Discover out-of-the-way places like Eikando Zenrinji Temple and Kitano Tenman-gu 北野天滿宮. There's much more to do: steep yourself in history at Fushimi Inari Taisha, take in the spiritual surroundings of Kinkaku-ji, wander the streets of Gion, and don't miss a visit to Nishiki Market. To see other places to visit, where to stay, and tourist information, read our Kyoto trip builder. Traveling by train from Hiroshima to Kyoto takes 2 hours. Alternatively, you can drive; or do a combination of ferry, taxi, flight, bus, and train. Expect a daytime high around 27°C in October, and nighttime lows around 17°C. Cap off your sightseeing on the 20th (Fri) early enough to go by car to Toyooka. Get some cultural insight at Himeji Castle and Takeda Castle Ruins. Discover out-of-the-way places like The Sand Museum and Amanohashidate. Venture out of the city with trips to Shirahara Kamogaiso Rocky Shore (in Iwami-cho), Ineno Funaya (in Ine-cho) and Kyotango (Hamazume Beach & Hacchohama Kobama Beach). The adventure continues: get great views at Street of Kinosaki Onsen and soak in some Japanese tradition at some of the top local onsens. 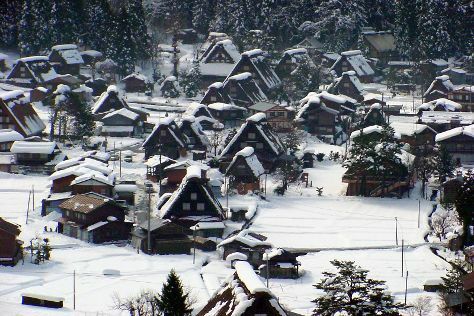 To see where to stay, ratings, reviews, and tourist information, read our Toyooka trip planner. Traveling by car from Kyoto to Toyooka takes 2 hours. Alternatively, you can take a train. When traveling from Kyoto in October, plan for slightly colder days in Toyooka, with highs around 23°C, while nights are about the same with lows around 17°C. Wrap up your sightseeing on the 24th (Tue) to allow time to drive to Kanazawa. Museum-lovers will get to explore Fukui Prefectural Dinosaur Museum and D. T. Suzuki Museum. Do some cultural sightseeing at Gassho Zukuri Minka-en and Gokayama. Explore Kanazawa's surroundings by going to Shirakawa-mura (Shirakawago Shiroyama Observatory Deck & Wada House), Chirihama Nagisa Driveway (in Hakui), Sakai (Tojinbo Cliff & Maruoka Castle), Ainokura Gassho Community (in Nanto) and Eiheiji (in Eiheiji-cho). There's much more to do: take in nature's colorful creations at Kenrokuen Garden, admire the landmark architecture of Tsuzumi Gate, take a stroll through Nagamachi District, and make a trip to Kanazawa Station. To see other places to visit, maps, ratings, and other tourist information, use the Kanazawa holiday planner. You can drive from Toyooka to Kanazawa in 3.5 hours. Alternatively, you can take a train. In October, daytime highs in Kanazawa are 25°C, while nighttime lows are 15°C. Finish your sightseeing early on the 28th (Sat) to allow enough time to travel back home.